Microsoft’s Virtual Earth it could be argued is reaching a tipping point whereby it becomes for the browser of choice for 3D city models. Yesterday we looked at Toulouse in France, part of the recent layer update released this week. 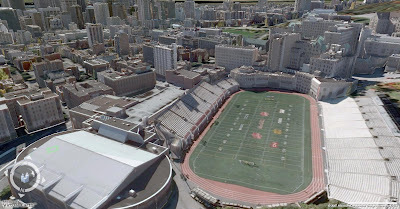 Today we look at Montreal in Canada – another city of their planned 500 over the next 12 months to get the Microsoft Photogrammetric treatment. With Microsoft releasing such detailed and large scale models it’ll be interesting to see Google’s responce. We are assuming it’ll be along the lines of new tools for the community to build the city from the bottom up..
Microsofts Sphere: The Ultimate Virtual Earth Viewer? is it possible to capture the 3d content from virtual earth via a opengl xtractor app or even adobe acrobat 3d capture feature? Is virtual earth using opengl to display the geometry? welll.considering that they made OpenGL work just via emulation in Windows Vista…I guess the models are not rendered through OpenGL…but DirectX or something similar..